Victor tomato is a heritage variety that would be lost if not for seed savers. 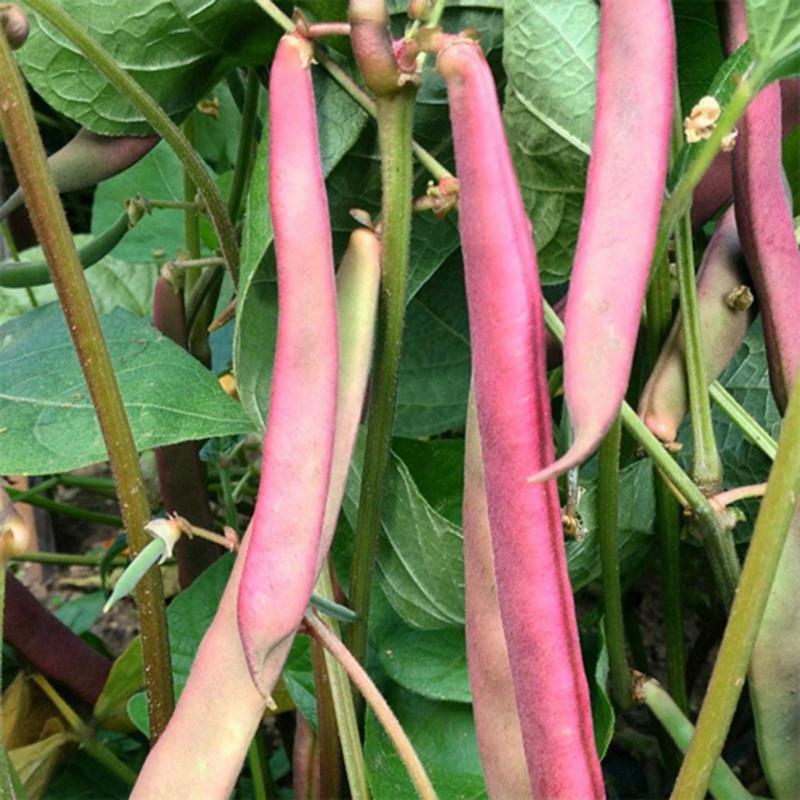 Tanya’s Pink Podded Uprising is a bush bean variety discovered in a Canadian garden. Bite into this: Rat’s Tail radish’s pencil-thin purple seed pods are delicious. 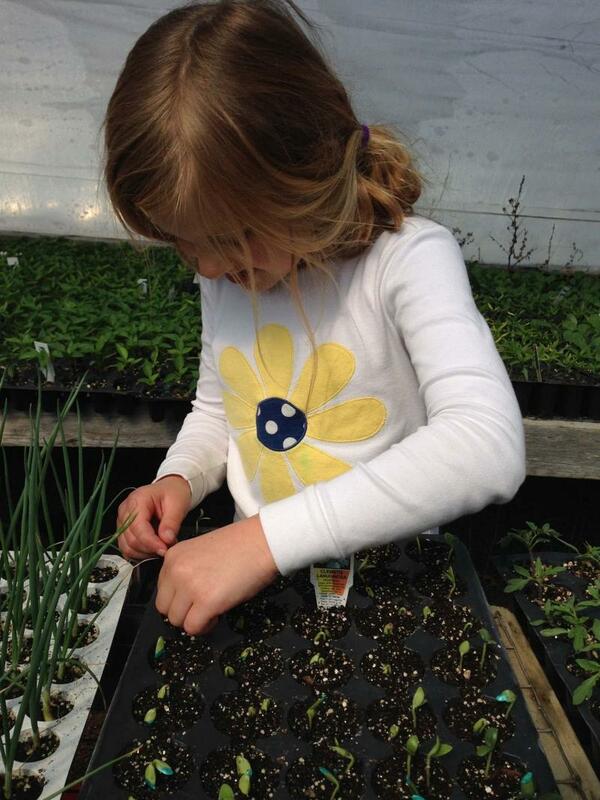 Food security starts right here: it’s never too early or too late to start your own seeds. Seedy Saturday is not like other events. While most annual events need to be extensively promoted in order to boost attendance, news of Seedy Saturday spreads to all corners of rural and urban communities like winged seeds carried by the wind. As seed savers and collectors flock to Seedy Saturday events across our country this February, what will they find? More importantly, what awaits you on Feb. 9 at the Canadian Mennonite University (CMU), where Winnipeg’s Seedy Saturday will take place? Kenton Lobe is a longtime volunteer and advocate for Seedy Saturday, which is hosted by CMU, Gardens Manitoba and USC Canada. Born in rural Saskatchewan, Lobe spent part of his childhood in India. Today, he teaches international development and environmental studies at CMU. With his attention on global concerns, Lobe, who has volunteered for the past 10 years with USC Canada, an international organization which promotes agricultural biodiversity, recognizes there are many issues surrounding seeds and food security. "The majority of people, though, come to Seedy Saturday for the seeds and their interesting stories," Lobe says. Let’s have a look. Rachelle Ternier is a second generation farmer in Saskatchewan. Together with her dad, Jim Ternier, and her mom, Marie-Louise, Ternier has been growing and harvesting seeds from earliest memory. Since taking over the family business, Prairie Garden Seeds, Ternier carries on the tradition of farming without the use of agricultural chemicals or synthetic fertilizers. Ternier is bringing a unique selection of grains and fava (broad beans) varieties. Martock fava is a sprawling plant with edible leaves, stems, seeds and flowers that resemble butterfly wings, markings and all. 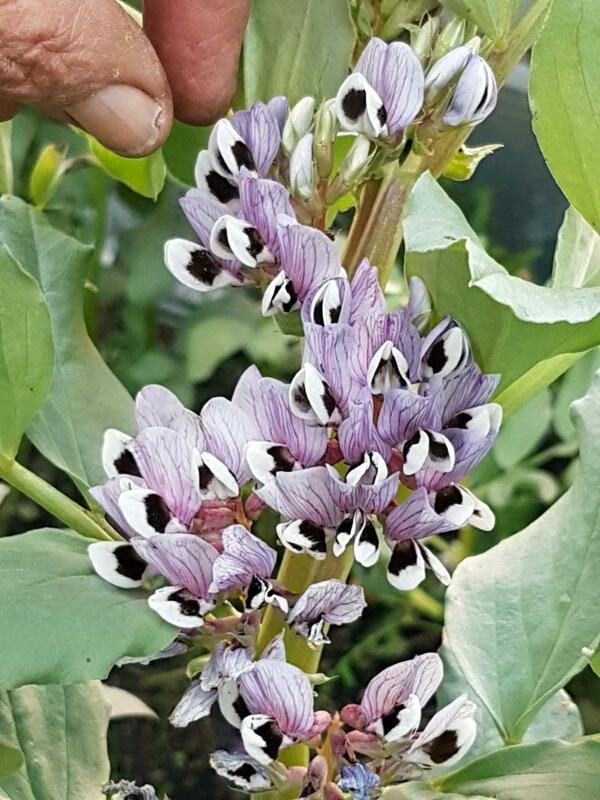 Ternier will also have a number of varieties, including Belgian Red-Flowered fava, which has crimson flowers, and Aprovecho Select, a giant that produces super-size beans and flavour. Since beans are good for you, why not grow several? Ternier will have purple podded varieties on hand, as well as fun varieties that are green with purple streaks. For rare seed collectors, there is Comtesse de Chambord, a small heirloom bean that is suitable for growing in a patio container. "We love Rat’s Tail radish," Ternier says. The name may not sound pretty (or appetizing); however, Ternier says that Rat’s Tail Radish is some kind of wonderful. 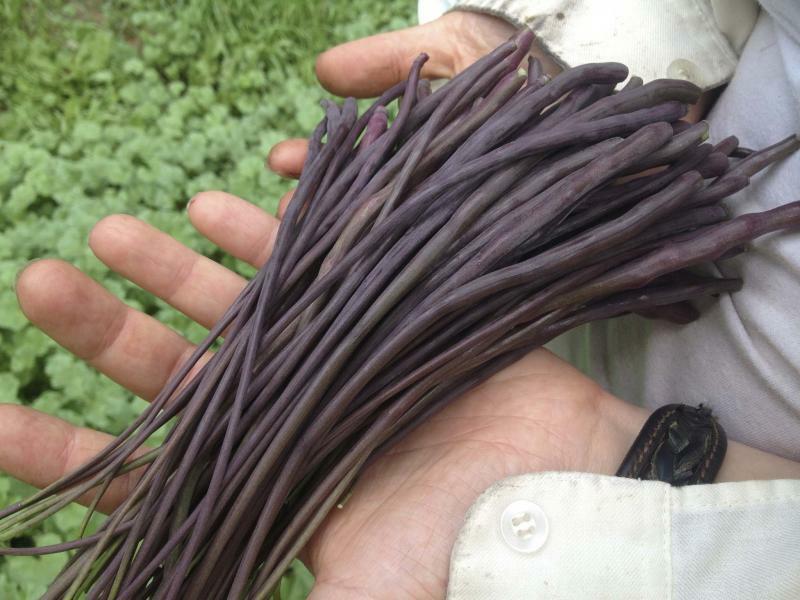 The long pencil-thin, deep purple seed pods are delicious eaten raw or try adding them to salads or stir-fries. The pods can also be pickled. New for this year, Ternier will also have Gete-Okosomin squash, an indigenous variety with large elongated fruits (up to 11 kilograms each). The bright orange flesh of this native American squash has a smooth, sweet texture. It requires a long growing season. Dave Hanson, of Sage Garden Greenhouses, is also bringing beans. Peas, too. Vividly coloured Tanya’s Pink Podded bush bean was discovered in a Canadian garden, Hanson says. Sweet peas are invariably hot items at seed sales and Hanson will have a classic sweet pea called America. Highly perfumed with bi-coloured blooms, this Victorian heirloom makes an excellent cut flower. Hanson will have more than 400 varieties of heirloom and organic seeds at next week’s Seedy Saturday. Since flavour is a factor that influences our seed choices, expect packets of cucamelon seeds to fly off the table. The unique taste of this ultra-cute and tiny fruit is a combination of sweet and sour, Hanson says. For flavour that will knock your socks off, try B&D Spice Mixers special blends of herbs and spices. Owners Donald and Bobbi Bartos are hot pepper specialists who buy rare and exotic pepper seeds from seed sellers around the world and use them to create their intensely flavoured artisanal blends. Home Grown Heat, for example, is a fiery mixture made from more than 194 locally grown, dried, ground peppers. There is one variety called O.M.G., which you may want to approach with caution. Crafted from 163 homegrown pepper varieties — each one with a ranking of more than 100,000 Scoville heat units — O.M.G. is not for timid palates. In addition to artisanal spice mixes that also include special blends for meat, hot pepper aficionados will be able to choose from the Bartoses’ curated collection of 80 different varieties of hot pepper seeds. There will be many more seed varieties provided by vendors such as Prairie Flora, Living Prairie Museum, Prairie Originals and Jensen’s Nursery, which is also bringing potted plants. Another vendor is Roy Beck, who will be travelling to Winnipeg from his home in Sedgewick, Alta., where he owns Broadview Farm. Beck will be selling his many herb, fruit and vegetable seeds at Seedy Saturday events across the Prairies from now until the end of March. Beck grows numerous and diverse varieties of summer and winter squash that are excellent producers. One unusual variety is Chicago Warted Hubbard, which was introduced commercially by Vaughan’s Seed Store in Chicago in 1894. Wonderfully warty on the outside and sweet and finely grained on the inside, enjoy it roasted, stuffed or in soups. For the hugely popular seed swap table at Seedy Saturday, Lobe is bringing seeds that he harvested and saved from the Victor tomatoes he grows each year. 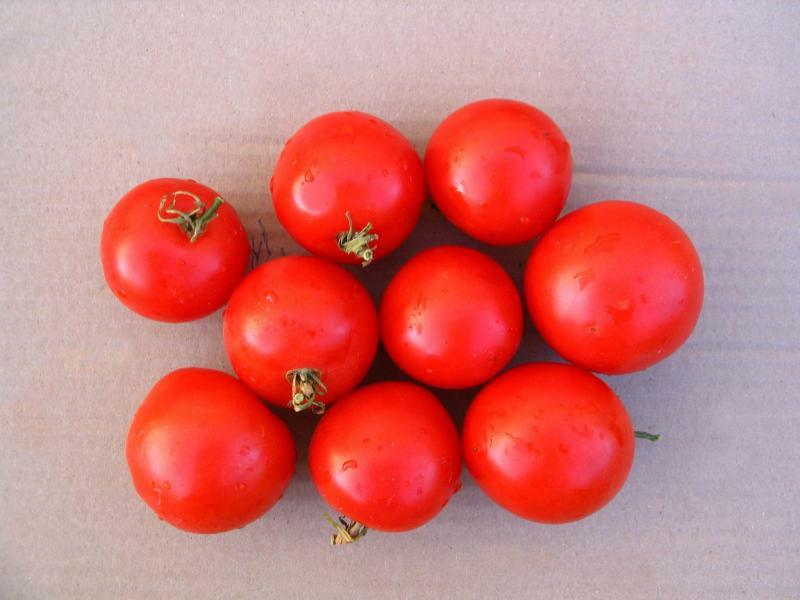 A determinate (bush) variety introduced in 1939 by Michigan State College, Victor tomato is a 1941 All America Selections award winner that is rare and hard to find. Crack-resistant with mellow, low-acid flavour, Victor produces clusters of red, globe-shaped fruit. If your appetite is sufficiently whetted, there is a serious side to seed saving and seed swapping that deserves to be considered. Lobe says that the simple act of saving seeds for sharing and exchanging ensures that varieties don’t disappear and, in short, helps to conserve biological diversity. "These are the very skills we need to be cultivating at the community level to build resilience," Lobe says. Seed saving and biodiversity support healthy ecosystems that, in turn, support people. In developing countries in the global south, Lobe says, seed saving is not a hobby — it is a livelihood. "Understanding that allows us to empathize with folks who live a precarious existence and whose livelihoods depend on selecting good seed." Jane Rabinowicz, executive director at USC Canada, says that seeds are our common heritage and the future of our food supply. "Seeds represent the ability for future generations to grow food," she says. And yet, seeds are under siege. The government of Canada is currently reviewing the Seeds Act, which governs the use of seeds. Some of the proposals being put forward, Rabinowicz says, would effectively prevent Canadian farmers from saving and reusing their own seeds — a foundational part of agriculture in Canada. If powerful corporate seed industry lobby groups are successful and intellectual property rights and rules related to seed are tightened, farmers, including our Prairie farmers, will face much higher costs. "We work directly with farmers in Canada and around the world," Rabinowicz says, "to protect biodiversity, to promote sustainability and to protect farmers’ rights. We will take a stance." In addition to a seed saving 101 workshop (including tips on how to hand-pollinate squash), this year’s Seedy Saturday will also include a hands-on seed-starting workshop. For more details, visit seeds.ca.